• Intersections of Science Technology and Culture – Alan Rauch, professor of English at UNC Charlotte. “Changes to science and technology happen rapidly, and it can be challenging for classroom educators to maintain an expert level of understanding in these technical concepts. Through our new Discovery Place Education Studio for professional development, we are thrilled to partner with Charlotte Teachers Institute to bring these learning experiences to our Charlotte teachers,” said Discovery Place President and CEO Catherine Horne. The Harvey B. Gantt Center will host CTI’s Visual Storytelling in Children’s and Young Adult Literature seminar, led by UNC Charlotte Associate Professor of English Paula Connolly. “Enriching the education of K-12 students by serving as a resource for teachers is one of three strategic objectives that inform all that we do at the Harvey B. Gantt Center. This partnership with Charlotte Teachers Institute supports our objectives and will also allow us to increase access to traveling exhibitions and our permanent collection, particularly the John & Vivian Hewitt Collection of African-American Art. As a result of this collaboration, the Fellows have become an extension of our small staff and will help expand our reach exponentially,” said Harvey B. Gantt Center President and CEO David R. Taylor. Two seminars take place at Davidson College (The Art of Fiction: Close Analysis, Style and the Novel led by Davidson’s Associate Professor of English Maria Fackler, and Human Agency led by Davidson Associate Professor of Philosophy Meghan Griffith). Heroes, Rebels and Rock Stars: Cultural Icons in Modern Europe led by UNC Charlotte Associate Professor of History Heather Perry meets on UNC Charlotte’s main campus. CTI Fellows from all eight seminars began with an orientation at Discovery Place in April and will continue to meet in their individual seminar groups through November 2014. Gartlan noted that all 104 Fellows (13 teachers in each of the eight seminars) and the seminar leaders receive free Discovery Place and Gantt Center memberships to further their independent research and cultural connections in the community. 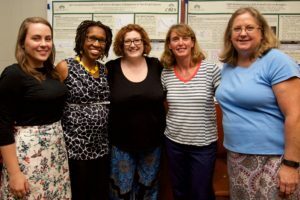 Through seminars led by UNC Charlotte and Davidson College faculty, CMS teachers learn new content, work collaboratively with other teachers, and develop new curricula for their students. Teachers serve as leaders in the institute and choose seminar topics they deem most important and engaging for current CMS teachers and their students. To date, more than 350 CMS teachers have participated in CTI seminars teaching more than 70,000 students. An affiliate of the Yale National Initiative at Yale University, CTI provides high quality teacher professional development led by expert university and college faculty. Programs include seven-month long, content-rich seminars and special events for teachers, as well as community presentations such as the popular Exploding Canons cultural collaboration series. CTI and its partners were recognized by the Council of Great City Schools with its 2013 Shirley S. Schwartz Urban Education Impact Award. CTI programs are made possible by a joint commitment of resources from CMS, Davidson College and UNC Charlotte and through the generosity of private funding institutions such as the Arthur Vining Davis Jr. Foundations, The Belk Foundation, Piedmont Natural Gas Foundation and the Wells Fargo Foundation. The institute is housed at UNC Charlotte within the College of Liberal Arts & Sciences. Posted on May 30, 2014 by Robin Mara. This entry was posted in CTI News, Press Releases. Bookmark the permalink.